Just four short weeks after the birth of Hazel, our bouncy new Golden Guernsey kid, we have had to say goodbye to Dylan the Southdown Sheep. 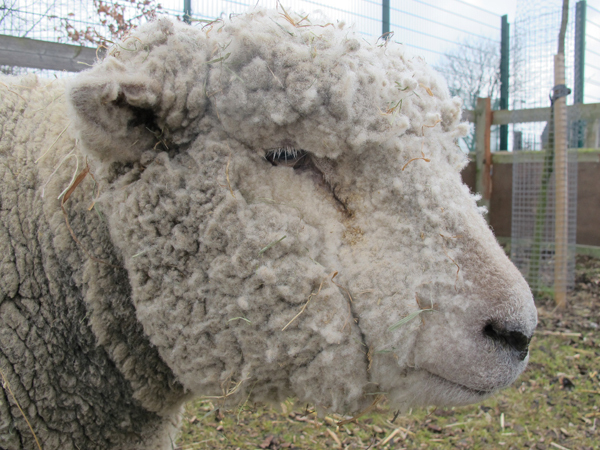 With his distinctive shaggy coat and docile nature, Dylan was one of the friendliest animals on the farm, always keen for some attention and a cuddle. His unexpected death leaves us heavy of heart. It prompted children from the Young Farmers Club to share stories about other animals that have died, reinforcing the role that animals can have in helping us come to terms with mortality. I am reminded of my beautiful little cat Sanglier, who died in 2008, and the grief that I instantly felt for her, yet struggled to access a couple months later when one of my closest friends died. I remember the bleating of the ewes on the neighbouring sheep farm, in the days after their lambs were taken away. Whether or not animals feel grief is a contentious issue, but they have long been used by humans as part of the mourning process.